So when I originally imagined doing some Halloween inspired pizzas for our twin boys Oscar & Theo I was thinking something a bit more spooky than a pumpkin. Of course, the spooky factor kind of suffered since my “spider legs” were to be built form slices of green peppers. Sadly I failed to double-check we still had a bell pepper in the fridge. We did not when it came time to make this week’s Sunday Supper. Instead of spooky, we have a bit more of a ridiculous look. Fortunately, the boys didn’t mind and loved their jack o’ lantern pizzas. I just simply took some slices of carrot and triangle cut a tomato slice for eyes and noses. Mix together. Sometimes I sauté the garlic and onions in a little olive oil first. It depends upon what else I’m putting on the pizza. I sauté them if the toppings are more mild, and I don’t if the toppings are more aggressive. Basically, whatever you like. In a bowl, proof the yeast by mixing yeast, warm water and sugar. Let stand until it becomes foamy. This will take about 5 minutes. In a mixer or large food processor, mix the flour and salt. Add the proofed yeast mixture and combine. Add olive oil and combine until the moisture is well-mixed into the flour. Add as much additional warm water to produce a dough which is smooth and not sticky. When dough is smooth and can be formed into a ball, it has been sufficiently kneaded. Place the ball of dough into an oiled bowl; turn to coat all over with oil; cover with a towel, or plastic-wrap, and set in a warm place. Allow it to double in size, which will take about 10-15 minutes, or 1 hour with regular yeast. When ready to proceed, preheat oven to 450. Punch dough down; cut into halves; form each half into a ball; roll-out each ball into about a 12” round. Oil pizza pans lightly, and place dough onto pans. Push the dough up slightly around edges to make a border to hold the fillings. Top pizzas with desired fillings, and moisten top by drizzling on some olive oil. Bake for about 12 minutes, or until dough is golden-brown and fillings are slightly bubbling. Assemble pizzas with a layer of sauce and plenty of shredded mozzarella. Then make your “spooky” or Halloween inspired masterpiece using toppings. Heat in a toaster oven or oven at 400 degrees cooking for 15 minutes. Please be sure you join us on Twitter throughout the day, this Sunday (October 28th) during #SundaySupper. We’ll be meeting up at 7:00 pm (Eastern) for our weekly #SundaySupper live chat where we’ll talk about all things Halloween. All you have to do is follow the #SundaySupper hashtag, or you can follow us through TweetChat. Oscar and Theo were recently discussing what kind of work they’d like to be doing when they grew older. One of their more inventive ideas is to open a new dinning establishment built to cater to the dream diet of the 5 year old consumer. Their favorite place to eat, I’m sad to say, is California Pizza Kitchen. To better serve their personal tastes, they plan to open California Candy Kitchen. When I asked what that is, they told me a restaurant that serves a large variety of candy and cheese pizza! I tell this story because it’s adorable, but I also share it because it’s about as ridiculous as news today announcing the Department of Agriculture has gotten Congress to agree to categorize pizza as a vegetable. Fortunately none of this is finalized to date and hopefully some extensive media coverage, including the NY Times, will impact this absurd recommendation. All of this is a subversive reaction by the food industry lobbyists to impact the trend toward healthier school lunch programs. Shows like Jamie Oliver’s Food Revolution have pushed this conversation into the national agenda and industry is finding ways to re-categorize their products so as not to impact profits. In our household, pizza is not a vegetable. It is simply a main course we eat when a meal has turned out inedible (aka a bad recipe) or as a special treat for the family. I’m still working on the boys liking Il Cane Rosso or Dough as a preferred option over California Pizza Kitchen. Until that happens, they will continue to prepare for a legal battle with CPK’s corporate lawyers. Last Sunday marked the 2nd Annual Texas Veggie State Fair. Yes, I said “veggie” State Fair, not to be confused with the one full of fried foods and pig races. You won’t find any of that here. Instead, what you will find are several food trucks, some vegan lifestyle demos, and a bouncy house for kids. What’s most noticeable though are the really long lines where people wait for food. We arrived 2 hours into the event at 1pm as the Jackalope Mobile Vegan Kitchen truck ran out of food. A neighboring truck called Geonarino’s was still serving food as was one of our favorite restaurants in Dallas – Spiral Diner. We decided to go with Geonarino’s since we had never tried them. Plus they were serving vegan pizza, something the boys would definitely eat. It was the saddest “pizza” I’ve ever seen. The boys didn’t really care because it was all dough and, for all its sadness, the dough was tasty. The toppings needed some work. For $5, a splash of crushed tomatoes and 4 shreds of vegan cheese was almost riot worthy. I’m surprised the crowd, which looked like it was taking an afternoon off from #OccupyDallas, kept calm even after such sorry food. My guess is the event attendees were good enough with Dallas actually having a Texas State Veggie Fair, even if the food was lacking and the lines were horrendously long. Just knowing more than 5 people enjoy vegan food in Texas, outside of Austin, is a revelation and will probably save this event from the failure it unfortunately deserves. Hopefully, this year’s strong turnout will cause more vendors to come. I really do want this to succeed but if I have to wait a hour for “pizza” and longer than 40 minutes for a smoothie – and don’t get me talking about how disgusting the bathroom was — I’ll find something better to do with a Sunday afternoon. Getting our boys to eat something new is never easy; though, it’s a lot easier when we include them in cooking the meal. Tonight we did a recipe my wife found from the website Weelicious: Pizza Balls. Pizza is by far their favorite meal (unfortunately.) Making pizza a new way made it a bit more interesting for us, but for Oscar & Theo there was doubt about what it is that came out of the oven and ended up on their plates. See, it didn’t exactly look like pizza so it received some scrutiny. Fortunately, after a few bites they agreed it was “yummy” and the best part is we can control what ingredients go into this pizza. Not bad. For the dough, we bought frozen pizza dough from Whole Foods. It too is pretty good and only with a few ingredients, no chemicals or sugar. For the inside we went with mozzarella cheese, sliced black olives, and diced green peppers added to the pizza sauce. Wrapping the pizza balls is fairly simple. You just make several 3″ round discs and let the kids spoon in a tablespoon of the inside mixture. Then fold over the dough to shape a mini hotpocket looking “ball” and add to a greased oven-safe casserole pan. Heat the oven to 425 and cook for 20-25 minutes. One change I’d make after doing this recipe is to add the cheese to the top of the pizza balls 5 minutes before they are finished cooking. Adding at the beginning, like the recipe calls for, burns the cheese. Cooking for a small time-frame should make for a little brown coloring and keep some of the flavor of the cheese. For the full recipe, please visit Weelicious Pizza Balls. In a world of $5 Hot ‘n Ready pizzas, why would anyone ever make a pizza from scratch at home? First of all it costs a small fortune with the San Marzano tomatoes, organic shredded mozzarella, and “sustainably raised” pepperoni. Secondly, it takes 30 minutes to cook the sauce, you have to roll the dough, and then you have to watch it incessantly in the oven to make sure it doesn’t burn yet the crust gets crispy. Homemade pizza is for the insane. There I said it. It really is, but sometimes it comes out perfect and puts the $5 pizza to shame. Tonight was one of those nights. We had made what looked like a foolish decision last weekend at the local Italian market here in Dallas, Jimmy’s Food Store, when we purchased some frozen store-made pizza dough. The one great thing about pizza is how fun it is for our twin 4 year old boys to put on the toppings of their personal pizza. Kids love making pizza and it really is ideal for getting kids involved in cooking. With easily $20 spent on ingredients we were ready to make some home-made pizzas. Thaw the dough if frozen. I put it in the refrigerator the night before using and by dinner time the next day it is ready for use. It’s best to also place it on the counter a hour before using to let it come to room temperature, but this step is not necessary. It just makes the dough a little easier to work with. Heat oven to 425 degrees. Move the oven rack to the lowest position if your heating element is on the bottom of the oven. This works best to help the dough cook. If your oven has the heating element at the top, move the oven rack near the top, but you will have to gently cover the pizza with foil on top after 6-7 minutes of cooking and continue cooking 5 more minutes so as not to burn the top of the pizza. Slice dough into 2 pieces and dust a board lightly with flour and work dough either by hand or by hand and rolling pin. What you want to do is make the dough really thin, almost where you can start seeing through it. Don’t worry about it being perfectly round or square, shape isn’t important. Once the dough is ready move it on to parchment paper (or aluminum foil though the pizza will stick a little if using foil.) 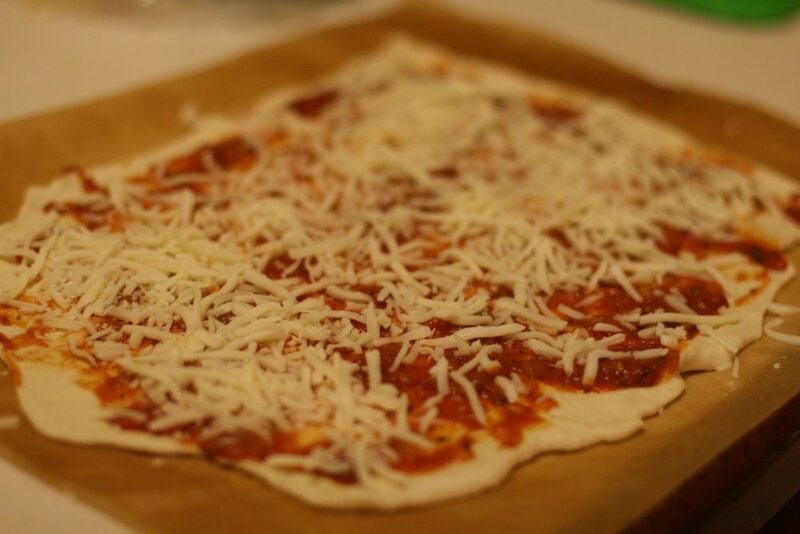 Spread some of the pizza sauce on the dough then sprinkle with mozzarella cheese. Add toppings to desired taste. Then move the pizza leaving it on the parchment paper to the oven rack. Place on oven rack and cook pizza for 6-7 minutes watching closely after 5 minutes to get to desired brownness on top. Gently place a piece of foil on top of the pizza when the top looks done, then cook for another 5 minutes. The final 5 minutes of cooking helps cook the pizza crust which can be doughy if taken out too soon. Slide the parchment paper on to a cookie sheet to remove the pizza from the oven and let it cool for 2 minutes before slicing. Slice and serve. Heat butter and olive oil in a small pot. Add the onion, celery and garlic to the pot and heat until translucent, about 3-4 minutes on medium heat. Do not burn. Add tomato puree and remaining ingredients and stir and heat to a boil. Once at boil, reduce heat and simmer for 30 minutes. Remove bay leaf and set aside to cool for 10 minutes and use on fresh pizza dough.